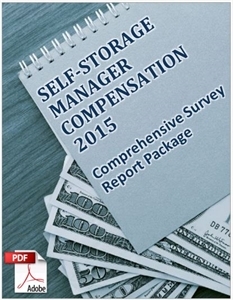 This package includes a detailed report on findings from the Self-Storage Manager Compensation Survey 2015 and an in-depth booklet featuring interviews on the topics of wages, benefits and incentives. NOTE: The manager-compensation survey report package contents will be delivered to your “My On-Demand Library” in a downloadable zip file folder. Issues related to staff hiring, training and compensation are among the hottest topics in the self-storage industry. In-depth and open discussion about manager compensation has been considered taboo by many, but managers want to know how much they should be paid in wages and benefits, while owners want to know how much they should be paying and which incentives to offer. Last year Inside Self-Storage (ISS) launched a comprehensive survey designed to create benchmarks within the industry. The “2015 Self-Storage Manager Compensation Survey” sought to collect authentic information regarding wages, salaries, bonuses and incentives. The anonymous questionnaire, intended for individuals who are responsible for the day-to-day management of a self-storage facility, focused on employee benefits, onsite housing, salaries and wages, and other metrics.